With THE ISLANDS AND THE WHALES getting a release this week in theaters and on PBS next here is my DOC NYC review from last year. 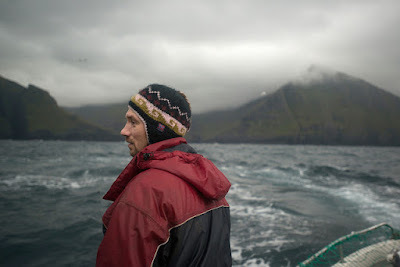 This is a must see on a big screen portrait of life on the Faroe Islands. The islands are located between Iceland and Norway have been inhabited for over a thousand years. However because the land can't really grow anything the islanders have always had to hunt, either the birds on the islands or fish or whale. Sadly times have changed and the bird population is dwindling. The sea creatures they eat are full of mercury and now people from America and elsewhere are coming to physically try and stop them from hunting whales. Low key slice of life on the Faroe Islands is like being there. Traveling with the men as they hunt, are home with their families and go to the doctor this is very much like being there. Its a lovely portrait of life on the island. At the same time the film raises all sorts of issues. Never mind the morality of whether they should be hunting whales and other animals for their food, rather its simply what are they going to do because the food they are accustomed to eating is killing them. The mercury levels in their bodies are high and one fisherman is told his levels are well past safe while his children's are acceptable, but won't be if they continue to eat the fish. Its a problem that we all maybe facing shortly. The main selling point of the film are the beautiful vistas in the film. I saw this film on a screener on Festival Scope and my eyes practically shot out of my head at the beauty of the images. Even the whale and bird hunting sequences have a beauty and a majesty that will take your breath away. In all seriousness the images in this film alone make this an absolute must see on any big movie screen you can find. And that's not to say the film beyond that is bad. Its not. Its a film I could wholeheartedly recommend on it's own terms.- however the images push it into must see territory. I loved this film. This is a beautiful film that acts as a kind of elegy for vanishing way of life. It is a thought provoking film that acts as a warning of our food supply and it is damn beautiful as well. A Must see.